Austria has filed a legal complaint against "an unnamed party" after media reports suggested Germany helped the US to spy on European targets. "Austria demands clarification," Interior Minister Johanna Mikl-Leitner said. German media, quoting leaked documents, said European firms and French politicians were among those monitored. 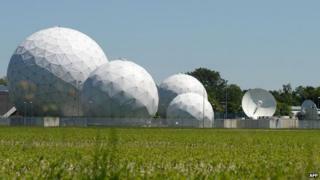 It said Germany's national intelligence agency, the BND, was working on behalf of the US National Security Agency. Ms Mikl-Leitner said there was no evidence yet it had been a target, but warned it was "not far-fetched to suspect that Austria was also spied on". "Today we have filed a legal complaint with the prosecutor's office against an unknown entity due to secret intelligence services to Austria's disadvantage," she said. There was outrage in Germany after the huge scale of National Security Agency (NSA) surveillance - together with that of the UK's surveillance agency, GCHQ - was revealed in 2013 by US whistleblower Edward Snowden. In the latest revelations, German reports said the Bad Aibling listening post in Bavaria was used by the BND to spy on the French presidential palace, French foreign ministry and European Commission. The German newspaper, Bild am Sonntag, said the BND also spied on Austrian federal agencies using search terms provided by the NSA. The agency also reportedly collected information at Washington's behest on European firms including Airbus and Eurocopter - now known as Airbus Helicopters - to check if they were breaking trade embargoes. The German government has come under pressure to reveal how much it knew about the alleged espionage and disclose a list of spying targets given to German intelligence by the US. Chancellor Angela Merkel, whose own mobile phone conversations were allegedly snooped on by the NSA, has defended the BND, saying intelligence agencies had to co-operate with their foreign counterparts to combat international terror threats. The reports are likely to cause embarrassment for the chancellor. In 2013, when she was the target of US spying, she admonished the Americans with the words: "Spying between friends, that's just not done." Mrs Merkel grew up in East Germany, where citizens were routinely spied on by their own government. Interior Minister Thomas de Maiziere has meanwhile denied having had any knowledge of German intelligence malpractice. He was directly responsible for the BND in 2008, when the agency first allegedly informed the chancellery that it was helping the NSA to spy on European aviation, aerospace and defence companies. He is due to give evidence to the Bundestag's intelligence committee on Wednesday.